Renamed "File" Menu to "Project"
Simplified "New Project" menu command - this is now streamlined into a single step. minor changes to other menus and toolbar buttons. Please See Menu Commands for new menu layout. Added “Group Operations” to Actions and Graphics Menu commands. (Build 137.21760) This command replaces the Active Pages Tab previously in Edit - Solver Setup. Now require separate Project Configuration (cfg File) for Steady State (ProBal) and Dynamic projects shown in separate lists. Provides clearer management of selected models and options for projects linked to a cfg file. Improved mechanism for creating new cfg files from a list of existing cfg files in distributed example projects using New Project Group menu option. Users can now filter the species on the Sp tab of pipes and other units to show only the species of interest. For example, if the user is interested in seeing only species contains Copper, they can enable the Filter and show only species contains Cu. 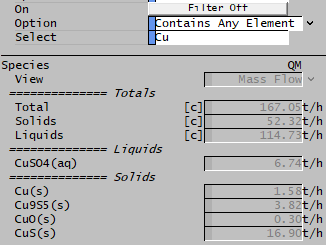 Filter can be applied to Elemental definition or species tags. This functionality is especially useful for projects containing many species. The Species Properties ($SDB) page allows users to filter the species, including additional option to filter based on temperature range for Cp. The FEM Reactor allows users to filter the species view, based on elements or text and/or Cp temperature range. This makes it much easier to configure and troubleshoot this model. 02GeneralReport.xlsx: This includes a simple stream information report and a simple overall mass balance report. 04DetailedReport.xlsx: This includes many reports extracting various information from the project, including Stream information reports, reactions, controls and other sub model reports. Generate the report to populate the data from the project. New optional GroupBy parameter with various options to separate groups of tags in the resulting report. For example, create neater reports by separating graphics pages with headings and a few blank lines. This example report is used in 04DetailedReport "Stream Table V" worksheet. TagSelect report generation time decreased significantly when using any of the optional ClearTags, ClearRange or Clear parameters. Makes use of the improved TagSelect Engine that can now return lists of SubTypes (Sub Models). Ideal for easily reporting all SubModels such as all Reactions, EHX, Makeups, etc. This example report is used in 04DetailedReport "Reactions_Detailed" worksheet. 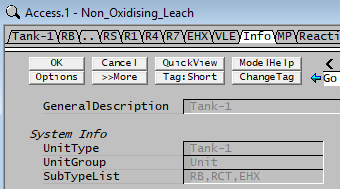 The TagSelect Engine is used in Excel Tag Select Reports, Find Units using Query and PGM Tag Select Class. 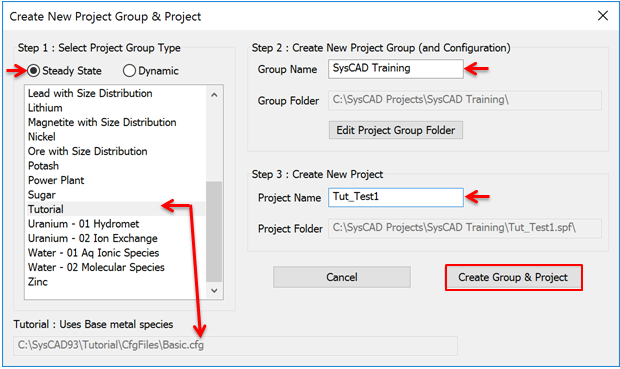 In previous builds the SysCAD TagSelect Engine only returned a list of model tags that meet a specified criteria. It is now possible to get a list of all SubModels or SubTypes that meet a specified criteria. For example a list of all EHX, MakeupBlocks, Reaction Blocks, Individual Reactions, etc used in any model, regardless of how the full tags are arranged and how many of the SubType exist in a specific model. When using TagSelect with SubTypes it is possible to reference tags in the parent or main model as well as the SubType as described in TagSelect. On the Info page of all models is a list of all SubTypes that a model includes. In the above example, the Tank Model has the Reaction and EHX sub models turned on. Most importantly global options for a project are compared and differences reported. User can chose to proceed using global settings from the current or imported project. Improved reporting of tag and file conflicts. Faster project merge time (various speedups). allow units with or without 'a' for absolute in pressure units (eg. psia vs psi). Please refer to Conversions - Defaults and Displays for more information. Added an option to remind user that changes have been made in the project (added/deleted models), user can elect to save the changes before solving the model. See Changes Detected - Save Project. This option can be switch on/off in the General Options - General Tab. Added option to allocate graphics page to user-defined Plant Area. Once defined, flowsheets will be grouped by Area in the Explorer Window, making it simpler to navigate around large projects with many flowsheets. Menu command Group Operations can be applied to these user-defined areas. Improved how graphics flowsheet pages are listed in Plant Model - Flowsheets page. New and improved options for Activating and Deactivating graphics pages. For species Nett flows shown on Links page where there are multiple phases for the species selected in Plant Model - Settings, a nett component tag is automatically added to easily report a nett species change. This makes species mass balance reporting significantly easier using TagSelect; for example for water balance using new Links tag Nett.Qm.H2O. Implemented support (primarily button bitmaps) for high resolution DPI (eg 4K) displays. Condition Messages in the Message Window on the "Solver Conditions Messages" tab are sorted as Error, Warning, Note. Minor updates for COM Automation interface and removal of unused or obsolete functions.